James Dellow made an excellent post today pointing us to some articles in The Australian which explore the ‘whats’ and ‘hows’ of instant messaging (IM). I think IM is one of the most useful tools for distributed community development and, interestingly, you don’t even have to use it to chat and it still helps. Let me explain. Here is part of my Skype buddy list. The names with the green circles and ticks are online and I can send them an instant message now (with Skype and can also talk to them). The green circles with the moons tell me they are online but away from their computer. All the rest (the grey ones) are offline. Now here’s the kicker. Research (see below) has shown that just being able to see those names and green circles makes you feel you are still connected to your community. This is an important point for community of practice leaders. By simply making IM available you are enhancing community interaction and a feeling of connectedness. Last month I did a series of interviews with John Smith, Etienne Wenger, Hubert Saint-Onge, and John Vucko (BHP Billiton Global CoP Leader) as part of a project to design a community of practice approach for one of the Australian Defence Groups. And while there was strong agreement that technology couldn’t make a community of practice—and in fact in some cases could kill a community—there was agreement that there is a minimum set of technology capabilities required when members are geographically distributed. teleconference facilities—I’m constantly amazed at how many large organisations don’t have a simple way to create and attend a teleconference. 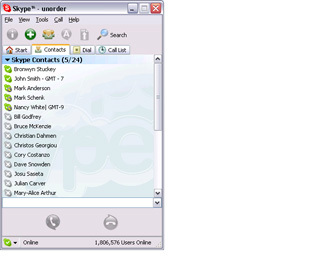 In IBM we used to just create a teleconference online then all participants would dial a 1300 number to attend. Nardi, Bonnie A., and Steve Whittaker. 2002. The Place of Face-to-Face Communication in Distributed Work. In Distributed Work, edited by P. J. Hinds and S. Kiesler. Cambridge, Massachusetts: The MIT Press.